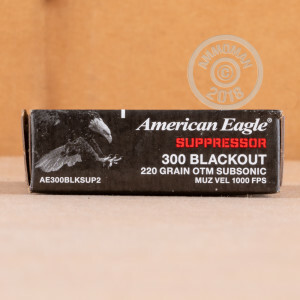 This .300 AAC Blackout ammo from Federal is particularly ideal for suppressed rifles. 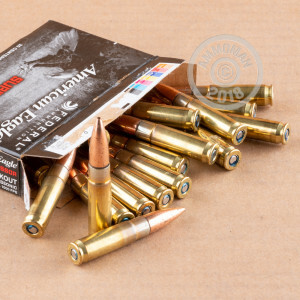 Each cartridge in this case of 500 fires a 220 grain open tipped match bullet at 1,000 feet per second. This subsonic velocity eliminates the "crack" that most bullets make as they cross the sound barrier. Expect good medium range ballistics with an approximate drop of 4 inches at 100 yards. These cartridges are loaded in Anoka, Minnesota using non-corrosive Boxer primers and brass cases. 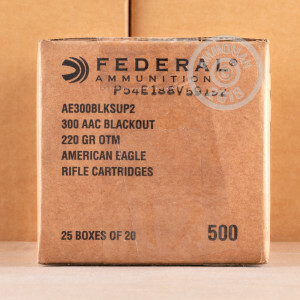 Save big on your shooting costs with this 500 round case--and then save even more with free shipping from AmmoMan.com (applies to any order over $99). This ammo was a great purchase. This ammo was a great purchase. It shot extremely well in my 16" Barrel SIg MCX. The velocity was very tight over the 8 rounds Chronoed with doppler on a Lab Radar unit. Velocity avg. of 1086.99fps, Std. Dev of 9.20fps. and Ext. Spread of 28.53fps. I'm looking forward to testing it in the same rifle with a suppressor.